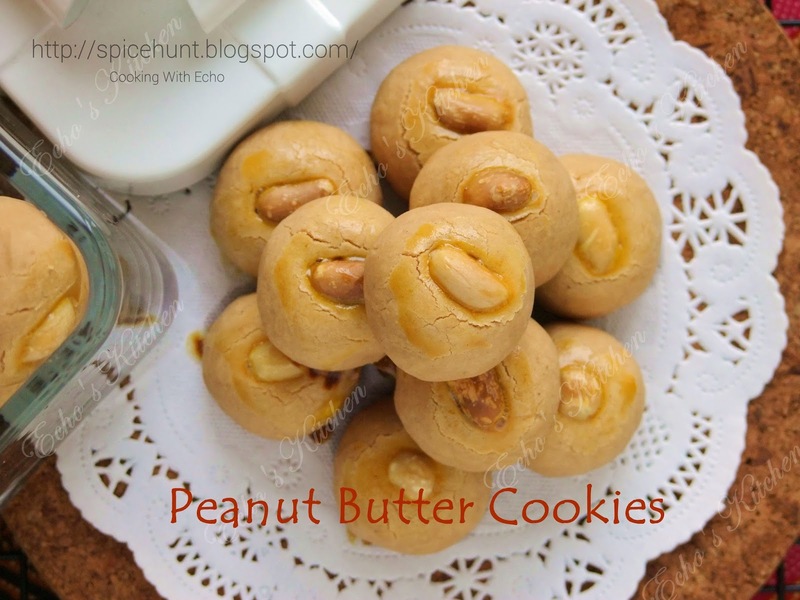 I have very fond memories of Peanut Cookies, when I was a little girl, I sometimes goes to the coffee shop a.k.a Kopitiam in my hometown for breakfast with my maternal grandpa, my cousin and I will asked for a treat after we finished our meal. There were these huge glass jars with red color cover that have all the goodies inside, the old time version of tidbits. Those see through jars are very self explanatory, they never needed labels or advertisement, everyone knows what is inside -- some fried peanut crackers, pickled papaya soaked in colored vinegar, long shape orange color crackers which name unknown to me up till today, coconut biscuit, and of course, this peanut cookies. It cost 5 cents per piece for this cookie then, not sure about the price now, and not even sure if those coffee shops still carry them! 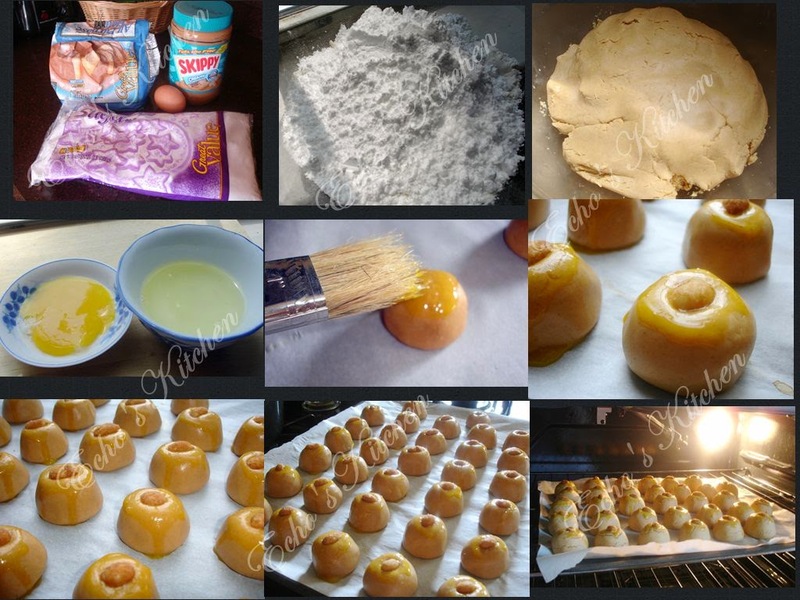 I got this recipe from a fellow blogger years back, recreating and tasting it made me miss grandpa so much. Those were the days. 1. Blend together castor sugar and all purpose flour, set aside. Separate egg yolk from egg white, set aside. 2. In a large mixing bowl, using a spatula, knead together all purpose flour, castor sugar and peanut butter. Knead it with patience and add in cooking oil slowly, do not add all the oil in at one go, just use as needed. 3. 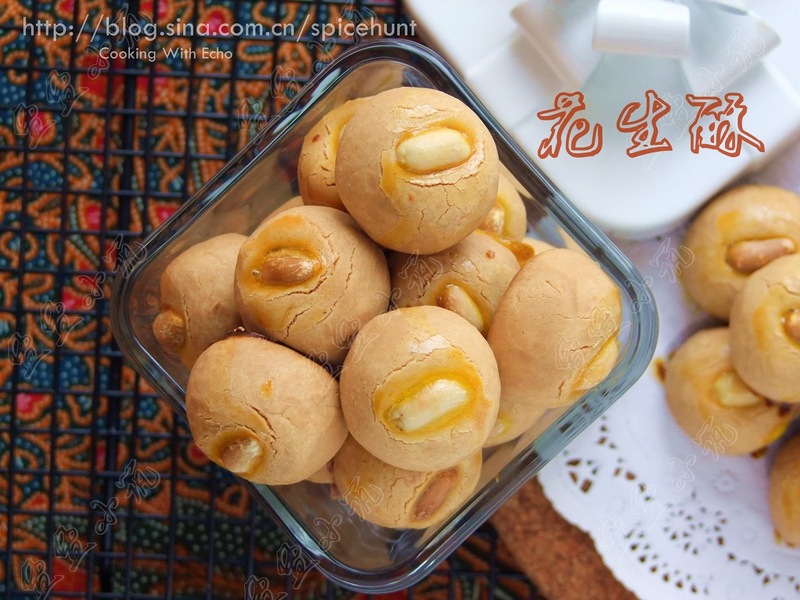 Scoop out 12-15 gm of dough and roll it in hand to form a small ball, use your fingers to lightly gather the center of the ball to make an arch like shape, the ball now looks like a small mountain, this is to help even baking. Brush egg york on top of the cookie, and pressed down a piece of split peanut. 4 . Preheat oven to 370 F，baked for 8-10 minutes, leaving the oven door ajar, wait for about 10 minutes before removing the cookie from oven. DO NOT touch the cookie when it is still warm, they break easily.